I know the feeling when you first find out that you’re expecting and you feel like you have TONS of time to prep and get ready and read every book known to man and feel like you could do this with your eyes closed. And then you give birth and you realize that there is a lot more to a newborn than the books or family and friends can prepare you for. Cue your pediatrician! That is where we come in handy, to help guide you along from day 1 all the way until your not so little one turns 18. 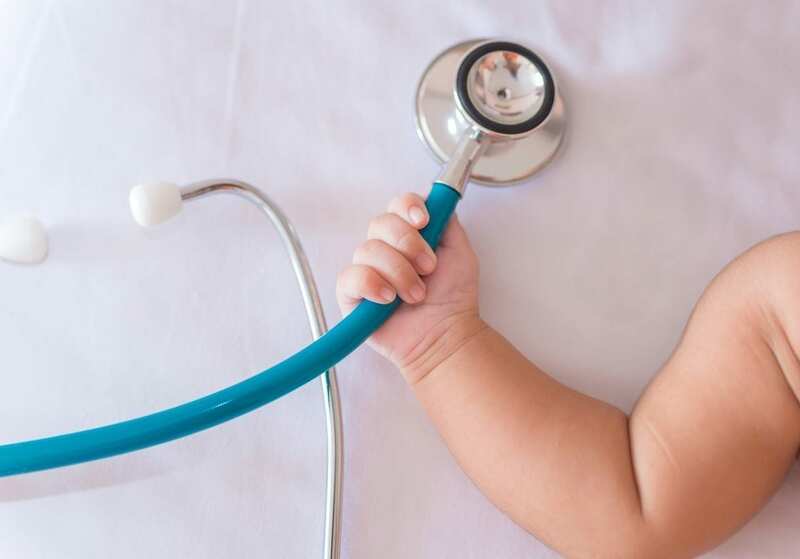 I’m here to tell you what goes on at baby’s first pediatrician visits to hopefully ease any worries that you may have about those first few months. The initial visit is usually when the baby is between 3-5 days of life, we see some right after hospital discharge if there were concerns with weight or jaundice and other ones we can see a little bit later if they are smooth sailing. That first visit is usually just a talking session, going over feedings and the count of dirty diapers and how much sleep is to be expected from the newborn. There are no shots or blood work usually done UNLESS there is a concern for jaundice and then we will check blood work that day. The next visit if all goes well is when the baby is 2 weeks old and that is where we are looking to see if he or she is showing good weight gain and most babies at 2 weeks would have regained or surpassed their birth weight. We also perform the newborn screen at that visit which is a state mandated screen looking to rule out treatable thyroid disorders, blood disorders, and metabolic disorders. If mom and baby seem like they are movin’ and grovin’; like we want to see them, then we will check back in around 2 months for the well check and first set of vaccines. Typically, at the 2 month pediatrician visit, your little one is due for 3 injections and one oral vaccine. Most offices use combined vaccines to minimize the number of injections and most also only carry preservative-free vaccines. After the 2 month visit, the schedule is 4 months, 6 months, 9 months and then one year. Vaccines are given at every one of those visit except for the 9 month visit where we will check hemoglobin and, if necessary, lead (if there are risk factors). At each one of those well checks, we are focusing in on how the baby is growing: height, weight and head size, going over all the milestones they should be hitting, making sure their physical exam is benign, and–of course–answering all the questions that come up in between visits. I highly recommend following the CDC schedule for vaccines, especially for that first year of life. There are so many exposures and their little immune systems are encountering new bacteria and viruses constantly and if there is something that can protect them from some of the very dangerous illnesses, vaccines are really a no brainer. Well that’s the first year of visits in a nutshell, it goes by fast so enjoy those babies!